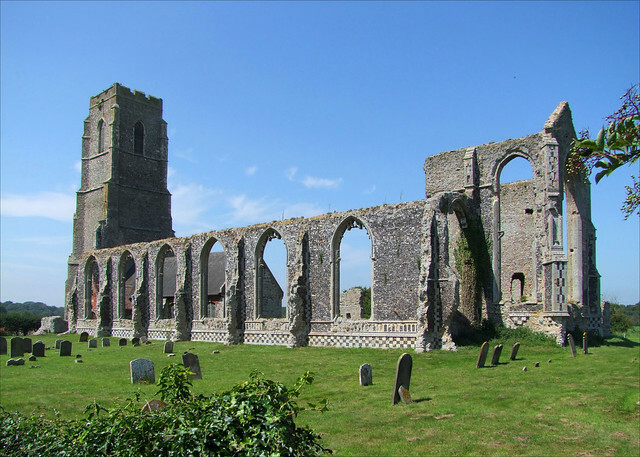 The great medieval churches of the north Suffolk coast are in various states of survival, according to the fortunes of history. Southwold is the complete municipal church, wonderful in nearly every respect. Blythburgh has been pulled back from the brink, a stunningly beautiful space fitted perfectly for the spiritual aesthetics of contemporary Anglicanism. Walberswick and Covehithe complete this quartet of huge churches, but you need to visit the first two to fully appreciate what was once here, and at Walberswick. There was a fifth great church at Easton Bavents, but that is now entirely lost to the sea. For, like Walberswick, St Andrew at Covehithe is a ruin now, and all that remains is a vast curtain of walling, which is almost complete. It dwarfs a tiny 17th Century church built against the tower within the shell. The eastern end of the ruin is especially impressive, with the rood loft stairs in the north wall still accessible, and what was clearly a vaulted crypt in the chancel. And yet, you need to remind yourself that this is not an ancient ruin. This church was rebuilt in the 15th Century at about the same time as Southwold and Blythburgh. As at Blythburgh, an earlier tower was incorporated. This tower still survives today. But the rest of the church was derelicted by the local people in 1672, less than two hundred years after it had been built. This was not out of any malicious intent; rather, the upkeep of such a great church placed too great a burden on such a tiny village at a time when public worship was a low-key and rather sober affair. It was a question of priorities, and a reminder that these great churches were not designed for the congregational worship they came to host after the Reformation. So the parish got permission to remove the roof, and then built the much smaller church against the west tower. The same thing happened at Walberswick. The tower is a very fine one, and was once an important landmark for ships at sea. Trinity House once ensured its survival, but nowadays the tower is in the care of the Churches Conservation Trust, as are the ruins. Thirty years before the roof was taken off, the iconoclast William Dowsing had visited the great church, on which occasion he ordered the destruction of about 200 images in stained glass. As in nearly every case, Dowsing would have been welcomed here with open arms by the churchwardens, who were certainly puritans themselves. When the new church was built, two inscriptions were placed in the north and south walls to remember the churchwardens Enoch Girling and James Gilbert, who put it out, that is to say the contract for the work. Inside the tiny new church, which is thatched, the original font is preserved. From a medeival historian's point of view, there isn't a lot to see in here, but it is a rather lovely rural space with a sense of the history of its community. The green west wall is rather alarming, although characterful. Of more interest perhaps is the external east wall, where you can find numerous lumps of masonry built into the base from the old church, including some decorated carvings, perhaps from shrines, piscinas and sedilias, as well as corbels which must once have peered down from a great height in the nave. These are rather mournful, if dwelt upon. Much better to wander about in the wild shell which surrounds it. In high summer the grass is bleached, and the structure becomes the bones of a great prehistoric animal foundering in a desert. The sunlight creates a silhouette of the ruin, lending a drama to the great rows of arched windows which run down the east and south walls of the church. In late afternoon, the west window of the former north aisle throws its shape the length of the former nave. Or come here on a wild day in autumn or winter, and there is a lonely bleakness to these ruins which are a more primitive affair than the similarly preserved ruins of the Abbey at Bury, or of Stanton St John. Covehithe itself is a lonely place, on the way to or from nowhere, and it contrasts greatly with busy Southwold and genteel Blythburgh. There is a farmhouse, and then houses to the east which have been abandoned now. Holiday-makers still come to visit the beach, but the path which runs to it past the church has now been washed away by storms, and it isn't possible to reach the beach that way anymore. St Andrew remains for now as a sentinel to the Suffolk which thrived in the late medieval period, and as a memory to the decline in that prosperity in the centuries since. Enjoy it while you can, because in fifty years time this church will not be here. By then, the sea will have carried it away, to join its former Easton Bavents neighbour to the south.